Parents, you know that it’s important to buckle your baby into a child safety seat. But it’s not that simple, according to car experts. Having a baby changes everything (sleep-deprived new parents, we feel for you), even the way you drive. The most lead-footed speed demons transform into Driving Miss Daisy when there’s a child in the back seat. A motorcycle-loving dad suddenly sees the merits of a minivan. And two twenty-somethings may find themselves spending hours at Target in the car seat aisle, trying to find the perfect seat to keep their baby safe and sound. But how will you know when you’ve found that perfect seat? And, even more important, how can you be sure you’re buckling and snapping everything correctly to keep your child as safe as possible on car rides? Our friends at Little Rock news station Today’s THV recently shared the staggering statistic that 9 out of 10 car seats in Arkansas are installed incorrectly. Why? Most parents simply don’t know what they’re doing wrong. 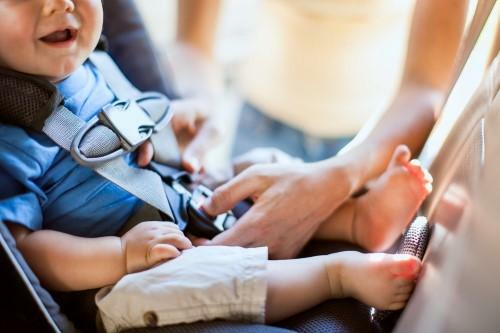 Did you know, for example, that safety belts should not be fastened over thick winter coats, which can keep the straps from holding your child securely? Instead, trying buckling your child in and then covering him or her with a warm blanket. This THV article will help you identify any mistakes you might be making. One car seat mistake many Arkansas parents are making? Why is it so important to replace car seats after an accident? The impact could have caused unseen damage so that the seat no longer protects your child in an accident. For the same reason, never purchase a used safety seat unless you can be certain it was never involved in a wreck. Consider the fact that a child riding unrestrained in a car that crashes at 25 mph will experience a force equal to falling from a 3-story building. Saving money on a new seat isn’t worth it. What are Arkansas laws for child safety seats? Arkansas law is clear on child safety seats: Any child younger than 6 years old and weighing less than 60 pounds must ride in a child passenger seat secured in the vehicle. Anyone who doesn’t comply with this requirement may be subject to a fine. Currently, there are no Arkansas laws that require manufacturers to replace your car safety seat if it’s damaged in a crash. But if you were involved in a car accident where the other driver was at fault, you likely can include the cost of replacing the seat in the sum of your damages. Be sure to discuss this option with your personal injury attorney. What resources exist for Arkansas parents? The American Academy of Pediatrics has more specific recommendations. Infants should remain in rear-facing seats until they are at least 1 year old AND weigh more than 20 pounds. Once they are over the age and weight requirement, they can ride in a front-facing seat with an internal 5-point harness. Don’t graduate your child to a booster seat until he or she weighs more than 40 pounds, and always use both the lap and shoulder belts with a booster seat. You can learn more about these guidelines at the Arkansas Children’s Hospital Services page. The attorneys at Taylor King Law want to work together with our community to protect our most precious asset: our children. Was your child injured in an accident due to a defective car seat? We’re here to help. Call today at 1-800-CAR WRECK or submit the Free Case Evaluation form to get answers to your questions about a defective product injury claim.